The quantum event detector is an array of avalanche diodes cooled to a low temperature so that electron tunneling noise supersedes thermal electron noise as the dominant noise source. Even with the high amplification factor of the avalanche diodes (about a million), only a tiny current is produced by the array. Also, it looks really cool when it catches the light just right. The next stage, a transimpedance amplifier built around the OPA656, uses a high speed op-amp to convert this small current to a usable voltage. Up to now, the entire device is built within a thermally insulated Faraday cage, using low-temperature tolerant components (e.g. automotive or medical rated), and on aerospace-grade copper clad Kapton PCB. 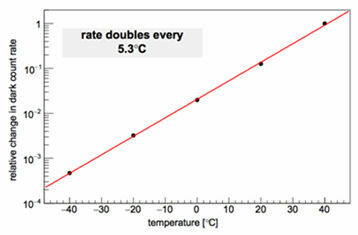 A water-cooled Peltier effect heat pump lowers the temperature of this component to around 245 degrees Kelvin. One neat benefit of this type of PCB material is that it has a very low thermal mass as a result of being so thin, so the cooling stages don’t have to deal with a lot of thermal mass. The output of this system is then pulse-shaped with a CD4069UBE Schmidt-trigger hex inverter. The time between these pulses is sampled using the 16-bit timer of an ATtiny2616 microcontroller. For any given three pulses, if the time between the first two is greater than the time between the second two, the serial port will output ‘1’. In the opposite case, it will output ‘0’. In the rare event the times are equal, no output will be generated. When the coffee machine is activated, it uses the quantum event detector as input to brew either caffeinated (1) or decaffeinated (0) coffee. I’ve always preferred quantized foods — a steamed bun if I want one of something, dumplings if I want 10, noodles if I want 100, and rice if I want 1000. Beverages were always problematic in this regard, so I’m quite happy to in some way finally have quantum coffee — even if I can still drink only half of it, although this remains largely theoretical and has never been observed in nature. P.S. Kudos to Joe Kim for the artwork! I take it this was intended as a joke. But I have learned from many thousands of very specific experiments — proposing things that ought to be possible, then tracking down the people and tools and methods and resources that would make it happen — it is nearly impossible to conceive of an idea that others, many thousands of others usually, have not already worked on for many years. The good news is that anything you can conceive of, because your mind is filled with what you know or have guessed, is likely to be possible, HackaDay hints at this, but there are things possible a simple quantum detector whose data is processed to tease out the gravitational and electromagnetic sources in the world around us. I keep track of quantum devices similar to what you describe. You are not far off in the approach, and the kinds of tools involved. You kept it as a joke, because it requires more than just one person to do well. And a joke, or a piece of an idea, that only produces one prototype, is kind of useless anyway. But I could really use a quantum noise source, amplified, and the monitored with high sampling rate ADCs, to check on correlations with other sensors, as I am sorting out phenomena belonging to “gravity” and “electromagnetism”. They are closely connected, but the tens of thousands of communities that have noted phenomena, have done so in various technical languages, often niche units and dimensions. So I have settled on “noise” as a common denominator among many devices that are reaching quantum sensitivity levels. You device offered in jest, is certainly possible. If you would accept that any piece of matter on the earth’s surface is going to be sensitive to many things, and you can see, count and quantify those sources if you gather enough precise data to solve for the sources. But it requires time of flight and correlation methods for single sensors in arrays. If you can determine direction of arrival (at the speed of light and gravity — they are identical) then you begin to have the data to image the sources and quantify them. But there is a much easier threshold to use, and that is the ability to measure acceleration fields (gravitational gradient fields) to parts per billion and parts per trillion. And the easiest “hacker” project is to build a sun-moon tracking system. Now if your quantum noise sources is like so many others, immersed in the many overlapping fields here on the surface of the earth, it has electromagnetic and magnetic acceleration couplings, seismic acceleration couplings, and many contributions through the graviational field from many locations. I am tired just now. I hope you will think about using amplifiers and high sampling rate, multichannel ADCs to gather massive quantities of data to begin to sort out the electromagnetic and gravitational world around us. I think you find that most of the noise in circuits and sensors and even quantum detectors and many many instruments, is just everyday flows and fluctuations in the gravitational field and electromagnetic fields from distant sources. There are well established networks and processing centers to take the data, if you can just build, test and calibrate the first purpose-built sensors. I could’ve done it with a 555. Did he get his recipe from W.G. Jung’s “Opamp Cookbook”? That’s a good reference but it’s actually from the datasheet of the silicon photomultipliers I purchased. It’s a pretty common configuration for reverse-biased photodiodes and the part I have is electrically similar. It also has a fast output that’s way easier to use (eliminating the need for a such a fancy first stage), but the pulse duration is near 1ns, so it’s actually too fast for a lot of the equipment I have. That’s why we need the transimpedance amplifier circuit to use the normal output that outputs a very weak but slower signal. If you make money writing this… That is the truly amazing part. This isn’t April fool’s? I thought surely no real person who can tolerate caffeine would want decaf half the time, completely at random. That’s some Heart of Darkness insanity. Can I make a quantum machine that randomly decides whether or not it wants to smack me over the head with a lead pipe in the morning? I always have trouble with that decision. They make money or they don’t make money. They won’t know until the statistics are measured, and the act of measuring them affects the measurement. So, just throwing this out there… Decaffeinated coffee still has caffeine, it just has less. So if decaf is also caffeinated, that means the quantum coffee simultaneously has caffeine and simultaneously has caffeine. Mind blown. What about using decaffeinated coffee and caffeinated water? Given the time/energy uncertainty principle, I will guess that you are uncertain about whether this test was done on April First or whether the coffee was actually brewed. Well, Sean, it is or it isn’t depending on how you observe it. Same with having one’s cake and eating it too, eh? or not eh? eh? Coffee and brown flavoured water. Yeah, I take issue with the phrasing “caffeinated or decaffeinated”, it should be as you said. sorry but, who decides if a “0” is caffeine or a “1” is caffeine? can’t imagine going through a day expecting to get a caffeine punch in an hour and not getting it. i’d just turn right around and go back to bed. I figured caffeinated coffee was the default state, and so assigned it 0. This needs a properly drawn schematic! The CD4069UB does not have a Schmitt-trigger input. For that, you would want a HEF40106B or even a old-fashioned 74HC14. Oops, thanks for that. I specifically bought CD4069UB for this thinking they had Schmitt-trigger inputs. Jokes aside, the housing of the bean dispenser would probably have to be totally soundproof in addition to being opaque, since sound waves can carry information about which side is being dispensed. In Vietnam we make coffee with something called a ‘phin’ (I don’t remember the English word). It’s a little metal tin you put ground coffee in and drip the hot water through. It uses reasonably fresh pre-ground beans, so I only need to worry about routing water. I’m terrible at designs with a lot of moving parts so this is for the best.